We’d love your help. 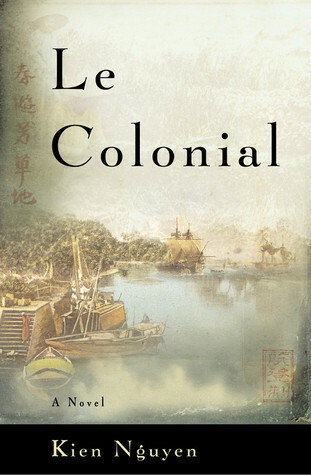 Let us know what’s wrong with this preview of Le Colonial by Kien Nguyen. A "richly satisfying" ("Newsday") epic of Asian history in the tradition of James Clavell, from the bestselling author of "The Tapestries." To ask other readers questions about Le Colonial, please sign up. I appreciated the historical intro to colonial Vietnam. It was an easy nod to historical fiction, without a lot of depth. Perfect for a long plane ride where you might not be at your sharpest. The prose was weak and obvious, and the characterizations were often peppered with soap opera-level insights. Not every character in every novel needs to be a brooding existential enigma, but a character like Francois in "Le Colonial" screams to be portrayed more a lot more ambiguously than Nguyen does here. In fact the very very very best lines of the book are the last sentences before what I'll call the "Afterword." At first, he didn't know what she meant. Then she pointed at a large mound of dirt in front of him. It was a termite nest, but with its raised outline, it resembled a grave. The answer came to him effortlessly. "Yesterday," he replied. Why couldn't all the writing be that mysterious and poetic? The aspects of the plot concerned with historical events were vivid, intense, and powerful (De Behaine and his characterizations included.) Almost every other plot point was sentimental tripe. Its really hard to know how to feel about such a wildly inconsistent novel. I liked it. I might even reread it, but I'm not sure I would recommend it? A disappointing portrayal of three French missionaries who travel to Vietnam in the late 1700s. The novel was a quick read, with some insight into the time period and the portrayal of France and Vietnam. However, the characters seemed poorly defined, their stories unsatisfactorily resolved and the flow of events plodding and a bit comic bookish. Good history of Vietnam. The usual unsavory influence of the clergy and politics. Interesting and entertaining. Left a few loose ends. Rather dissatisfying ending. Kien Nguyen was born to a Vietnamese mother from a once wealthy family and her American civil engineer lover. His mother's family, who had lost their wealth when the French left Vietnam, lived among neighbors who treated them as pariahs because of their colonialist background. Kien, a child of mixed race, was especially ostracized from the community. He left Vietnam in 1985 through the United Natio Kien Nguyen was born to a Vietnamese mother from a once wealthy family and her American civil engineer lover. His mother's family, who had lost their wealth when the French left Vietnam, lived among neighbors who treated them as pariahs because of their colonialist background. Kien, a child of mixed race, was especially ostracized from the community.